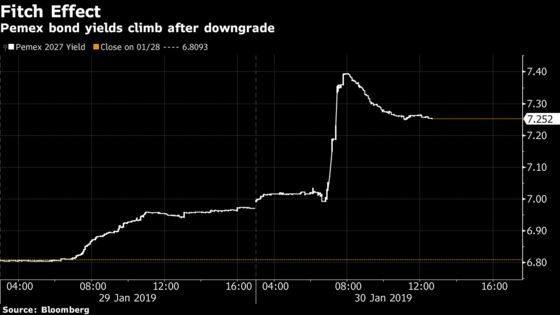 (Bloomberg) -- Petroleos Mexicanos bonds cratered after Fitch Ratings downgraded the state-owned company to just a notch above junk, spurring a slide in sovereign debt and the peso. The yield on Pemex bonds due in 2027 rose 28 basis points to 7.251 percent at 1:02 p.m. in New York, after jumping as much as 40 basis points earlier in the day. Its five-year credit default swaps climbed 24 basis points to 319. "The ratings agencies are pretty clear on what they need," said Edwin Gutierrez, a money manager at Aberdeen Asset Management in London. "The sovereign needs to get its act together and make it clear what kind of support they are prepared to give as what’s been given thus far is clearly insufficient." The stress on Pemex is having a spillover effect. Mexico’s peso lost 0.9 percent to 19.16 against the dollar on Wednesday -- the worst performance among the world’s major currencies -- while the country’s benchmark 10-year dollar bond yields increased 4 basis points to 4.56 percent. The Mexbol stock index fell 1.1 percent. Lopez Obrador acknowledged the downgrade in a Wednesday morning press conference, saying that “Pemex is better than it has been in the last thirty years.” He also added that the government will continue to support the company. Yet some traders are concerned that if Mexico doesn’t come up with a capital injection for Pemex soon, the spillover could become more severe. "Investors have AMLO’s policy process under a microscope," said Michael Roche, a strategist at Seaport Global Holdings in New York. "If the expected capital injection is not forthcoming then the market will build a higher political risk premium into the Mexico sovereign spread."